What sort of things you know in Google webmaster tools? As a webmaster we are very much aware about Google webmaster tools. And we know we can do very importance things for our website by Google webmaster tools. ◊ Check and set the crawl rate. ◊ Generate and check the robots.txt. This will help to recover that page blocked by robots.txt. ◊ You can get keywords searches on Google led to the site being listed in the SERPs and CTR. Is there any more? what do you think? Awesome AJ! Google Webmaster Tools is an excellent free tool for webmasters to see how Google sees their site. By using it you can find out things about your site that you might not otherwise be able to know about. It also helps Google to know about your site and helpful in telling it how to treat your site too. All those things are correct and should be done. One thing people often overlook though is the Geographical targeting feature. It could be for example, that you're in Europe or the UK like me, but you want to target the US locality. 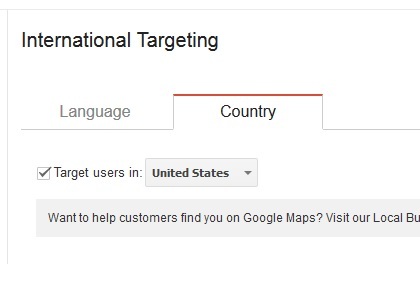 In which case you would need to visit the International Targeting page and set it to Target Users in: United States. Let me tell you how useful and effective doing this can be. I once had a site that targeted BlackBerry mobile buyers. This was around the time that I didn't really know much about Google Webmaster Tools. I had a friend who had a competing site but we were both using the same affiliate so we helped each other rather than go up against each other. Well I couldn't understand why my site wasn't ranking very well and then he told me to set United States as the country to target in my Webmaster Tools. Literally overnight my rankings exploded because of this and Google started ranking and listing me in more US searches. All because of that simple trick! Another thing a lot of people don't realize is that you can link your Google Webmaster Tools to your Google Analytics account. This way, all your Analytics profiles will be available to view in Webmaster Tools and you can also gain access to a few more Analytics features too. Also when you do this you will be able to see a lot more information and data about your site such as the queries and keywords that you're ranking for and which ones are getting clicked the most. And which of your landing pages are ranking and the geographic summary etc in a lot more detail than you wouldn'tt be able to see if you never linked the accounts. So if you've got both, link them! Google webmaster tools is lately called "Search console" actually and it's very helpful tool for everyone who cares about their website, SEO and SERP. Check that even daily or at list weekly. It can turn your efforts in great conversion if you use it smart way. very simple tool to use with great features and makes Google better place to play around. I personally use it few times per week and resubmit my websites for additional crawling, specially after some changes or new content added to it. Search stats can also see which contents of your website is getting you most visits from Google search, so you can work on more articles with same or similar keywords. Hi anwebservices thanks for your opinion. Google webmaster tools which now called search console really awesome and ever best free tools. And I think if any webmaster want to be a best position on Google, no one better than Google search console for getting all such importance report for website. I never think any SEO work without Google search console. All most importance task, you can do by search console. I also pointed in my above discussion. Yes I know how to do most of those things... but Ajlancer can you please explain the crawl rate? I only know about fetch as Google once I publish new content or update content. Hi Lynne crawl rate depend on so many things, I mean you have to do sort of work for updating crawl rate. I am going to descried something about crawl rate. Thank you Ajlancer, yes I do all of those things so far but I have never paid attention to crawl speed before. I don't think I've ever seen that. I always ping my content after publishing it, I use Pingoat. What website do you recommend for pinging? Are some better than others? I know some people use a paid service, why would someone do that when they can ping for free? Crawl stats explains how many of your pages are checked by Google crawlers, how much time they spend to read your pages... So if they spending more and more time to read your website pages, you may need to work on improving your website speed by optimizing it for faster crawling. OK so your crawl speed should be as fast as possible. I'll have a look at that, thank you for the pointers. Yes! The faster Google bots read your pages they see it as better optimized and it can increase your SERP too. Perfect thank you! My one website is quite slow right now because I had an online store and loads of plugins... my sister and I are going to be making some big changes there soon to make it faster and lighten the website. Hopefully within the next few weeks. The Google Webmaster Tools, which is now known as Google Search Console, is a great web service that Google offers to web masters for free. Considering how important Google is for websites, it is really great that this is for free as webmasters need to be aware of how their site is doing especially for the indexing status. With the information they can get through this tool webmasters will be better able to make decisions and improvements for their site. They can optimize its visibility, check click through rates, check the crawl rate, demote certain site links and all those possibilities you mentioned too.